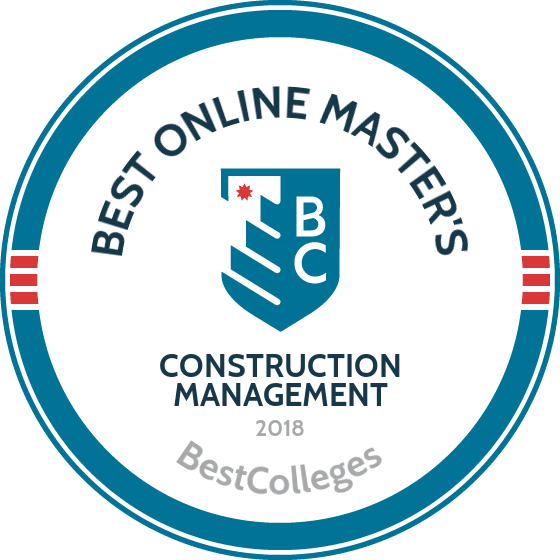 WHAT ARE THE BEST ONLINE MASTER'S IN CONSTRUCTION MANAGEMENT PROGRAMS? What Else Can I Expect From an Online Master's in Construction Management Program? An online master's degree in construction management is perfect for those with well-rounded project management skills who are interested in a career in architecture, civil engineering, or construction science. The Bureau of Labor Statistic projects that jobs in construction management will grow by 5% by the year 2024, which is on pace with the national average. The average annual salary for construction managers is $89,300. Earning a master's in construction management online can provide you with advanced planning and budgeting skills and prepare you for a variety of managerial positions in the field. includes 17 credits of core courses on topics such as project controls and building systems. Graduates are prepared to pursue careers in construction management, real estate development, architectural engineering, and more. The finance track offers courses in topics like mortgages, capital, and investment. The real estate track emphasizes feasibility studies, and advanced investment analysis. Finally, the AEC track focuses mainly on design and modeling. This program is typically completed over three semesters, including one summer term. Application deadlines are January 15 and September 15 for the fall and spring semesters, respectively. USC is accredited by the Western Association of Colleges and Schools. consists of 12 seven-week courses and can be completed in just two years. The program includes nine credits of core courses designed to develop a student's practical acumen in managerial decision making, with the remaining 27 credits completed in elective coursework. The curriculum includes courses on a variety of topics, such as lean construction, soils in construction, and natural hazard resistant construction. Applicants must have a bachelor's degree with a minimum 2.75 GPA and submit GRE scores of at least 300 to be considered. Those who do not hold an accredited undergraduate degree are required to take MSCM leveling foundational courses, with each course running for seven weeks. These requirements may be waived for those with more than three years of experience in the field of construction management. Drexel offers a master's in construction management online with three concentrations: construction project management, real estate development, and sustainability and green construction. This program is ideal for those who want to pursue senior construction supervisor roles. The 45-credit master's of science in construction management if offered during four 10-week sessions per year. Foundational courses cover a variety of topics, including finances, leadership, and quality control. Each concentration includes a collection of 15-24 credits of specific coursework, and all concentrations conclude with a culminating capstone experience project. The project management concentration includes classes on topics such as contract administration, quality, productivity, and performance. The real estate concentration offers courses dealing with a range of aspects with finance and the business market. Finally, the green construction concentration includes specialist courses on LEED concepts. Drexel is accredited by the Middle States Commission on Higher Education. ASU offers a construction management master's degree online through the Del E. Webb School of Construction and Ira A. Fulton Schools of Engineering. This program provides students with proficiency in procurement, maintenance, and operational leadership in the construction industry. This 30-credit master's of science in construction management includes three three-credit core areas: project management, project controls, and construction technology. The remaining coursework is completed in electives and research classes. The curriculum includes courses on a variety of topics, such as facilities operations and maintenance, construction productivity, and information technology in construction. Students can also complete an optional six-credit research thesis. Applicants must submit GRE scores and have a bachelor's degree with a minimum 3.0 GPA in their last 60 hours of undergraduate study to be considered. ASU is accredited by the Higher Learning Commission. NDSU offers a master's of construction management degree that can be completed entirely online. This online construction management master's degree allows students to earn two certifications: the associate constructor certification and the certified professional constructor certification from the American Institute of Constructors and Constructor Certification Commission. The 30-credit curriculum includes nine courses on a variety of topics, such as constructional quality control, business economy, and relevant information technologies. Students can earn their degree in as few as nine months, though most study for longer and only enroll in 6-8 credits per term. Applicants must have a bachelor's degree in a related field with a minimum GPA of 3.0 to be considered. Application deadlines are May 1st and October 1st for fall and spring semesters, respectively. NDSU is accredited by the Higher Learning Commission. Construction management master's degrees typically offer a variety of optional concentrations. Likewise, construction management is sometimes offered as its own concentration within a dedicated graduate program in civil engineering or business administration. Most master's programs in this discipline include core coursework in fundamental concepts and require a capstone course or final project of some sort. The curriculum for a master's degree in construction management can vary widely from program to program according to a student's chosen concentration. Common concentrations include real estate, construction project management, and green construction. However, all programs emphasize the same core skills, such as advanced leadership, accounting, and project management. Below is a sample curriculum that includes courses that you can find in any master's in construction program. Building Systems: Materials and Construction: This course explores the development of building systems in the context of architecture, providing students with a foundational architectural background. Coursework covers topics like selection, integration, and innovation of materials. Construction Accounting and Finance: This course explores accounting and financial methods, which are among the most important skills for construction managers. Coursework covers topics such as cost control and engineering economy issues. Project Controls: Budgeting and Estimating: In this course, students review case studies and complete practice software exercises to become familiar with cost-estimating, budgeting, and cost control methods and technology commonly used in the industry. Project Controls: Planning and Scheduling: Students in this course are trained in the fundamental principles of planning, CPM scheduling, and resource management using current and emerging project scheduling software and applications. HOW LONG DOES IT TAKE TO GET AN ONLINE MASTER'S IN CONSTRUCTION MANAGEMENT? The amount of time it takes to earn a master's in construction management online depends on several factors, including whether you plan on studying part- or full-time, whether classes are delivered synchronously or asynchronously, and a program's individual degree requirements. Many construction management programs may expect students to already have some experience during admission but not include an internship requirement, which can reduce the amount of time it takes to earn a degree. Others offer an accelerated track that is only available to online students. While the total number of credits needed to graduate will vary from program to program, a typical online master's in construction management can be completed in 15-24 months. When searching for the right online master's in construction management program, be sure to choose programs that are accredited. Any legitimate college or university on your short list of prospects should be accredited by an agency such as the Higher Learning Commission, Middle States Commission on Higher Education, or the New England Association of Schools and Colleges. There are two main types of accreditation: regional and national. Regional accreditation is considered more prestigious and is pursued by nonprofit public colleges and universities. On the other hand, national accreditation is typically earned by for-profit colleges and trade or vocational schools. Construction management programs may also receive programmatic accreditation through The American Council for Construction Education (ACCE). These agencies are overseen by the U.S. Department of Education (ED) and the Council for Higher Education Accreditation (CHEA). The ED and CHEA each maintain a complete list of accredited institutions on their websites. Graduates with a master's in construction management online are eligible for advanced positions as contractors in specialty trades, residential and non-residential building, and engineering construction. Some graduates also choose to become self-employed. In construction management, extensive field experience is highly valued alongside an advanced education. Generally, employers prefer candidates who have at least a few years of experience in construction paired with a degree. Below are a few common careers for graduates with a construction management degree. Construction managers are responsible for all facets of project management for construction projects from start to finish, including coordinating budgets, scheduling, and handling human resources tasks. While a master's degree is not the minimum requirement for the field, employers are increasingly requiring candidates to have a specialized degree in construction management, construction science, architecture, or engineering to be considered for top jobs. Cost estimators who specialize in construction are responsible for providing detailed estimates of the time, money, materials, and labor required to construct a building, residence, or commercial space. Employers typically require at least a bachelor's degree and relevant work experience for entry-level jobs, while some may prefer additional industry certification. Similar to a project manager for a construction team or project, architectural and engineering managers coordinate all aspects of production and building activities for architecture and engineering firms. While many candidates have a master's in engineering management or an MBA, some employers will pay employees to go back to school and obtain such credentials if they have a closely related degree in a field like construction management. Salaries for construction managers can vary depending on each employee's level of education, years of professional experience, and additional industry certifications. Professionals with a construction management master's degree can expect their earnings to be higher than their colleagues who have a lesser degree and fewer years of experience in the industry. This industry values experience alongside education, as most construction managers with 20 years or more of experience enjoy a significantly higher salary late in their careers. The table below outlines median salaries of construction management professionals throughout their careers. Membership in a professional organization can offer a variety of opportunities for current and aspiring construction managers at all stages of their careers. These professionals have access to in-person and online networking opportunities, such as conventions, seminars, and guest speaking engagements. They also have access to job boards, continuing education webinars, and more. The following are some of the premier national organizations for construction managers. CMAA promotes quality-focused, cost-effective, dispute- and injury-free project delivery within the industry through services like publications, professional development, and certification opportunities. AIC helps to facilitate certification examinations for aspiring associate constructors (ACs) and certified professional constructors (CPCs). The organization also offers various individual and corporate membership opportunities, including online education events, an interactive job board, a newsletter and journal, construction ethics resources, and more. The ABC is a well-known national construction industry trade association. ABC represents more than 21,000 members and is the most visible voice for workers in the industry. This organization regularly communes with the legislative, executive, and judicial branches of the federal government, state and local governments, and the news media to advocate for construction workers. AGC of America facilitates better business practices throughout the construction industry, creating opportunities for employees to improve their working conditions and for employers to optimize growth and future prospects. Membership provides professionals with a variety of continuing education and networking opportunities, as well as unique discount programs for vehicles, machinery, tools and more. When it comes to financing your education, the first step for all students should be filling out the Free Application for Federal Student Aid (FAFSA). This allows you to apply for federal financial aid, including work study programs and federal student loans with payment deferment and reasonable interest rates. Filling out the FAFSA is also a common requirement at most colleges and universities if you want to take advantage of the school's financial aid opportunities as well. Financial aid opportunities in a career-oriented field like construction management are typically plentiful, as many employers are happy to offer scholarships to students who could potentially contribute to their businesses as employees after graduation. Others offer paid work opportunities or employee-reimbursement programs to those seeking hands-on experience in the industry while earning their degree online.